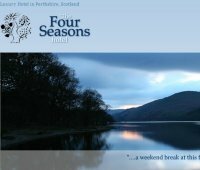 The Four Seasons Hotel is situated on the shores of Loch Earn, Perthshire, and is the ideal location for a relaxing holiday in Scotland. The natural beauty of this location is the first delight for every visitor to St. Fillans, and the position of the Four Seasons, looking south-west down Loch Earn, is one of the most enviable settings in Scotland. Originally built in the early 1800's for the manager of the limekilns, the main house then became the schoolmaster's house. Converted in the 1900's, it has been extended over the years to a comfortable hotel with a number of individual sitting rooms, twelve bedrooms, six chalets and a holiday apartment. All our spacious rooms are ensuite, mostly with bath and shower. Many enjoy uninterrupted views down Loch Earn. Rooms vary in size, and some can accommodate an extra bed.